Come with me and you'll be in a world of pure imagination. We’ve seen mini-nuke babies. Craftable robots. A refined dialogue system. Post-apocalyptic maid services. Approximately a million more radio stations. And Randy god-damn Savage. 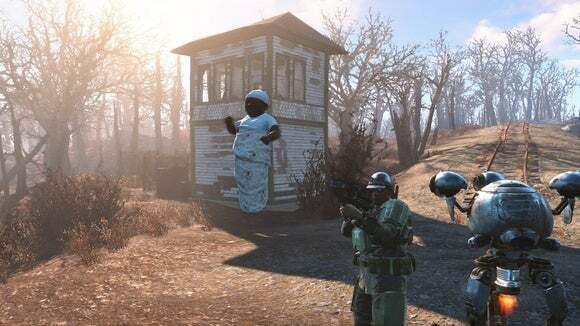 Yes, the Fallout 4 modding scene is truly thriving. Expect the modding scene to really whip itself into a frenzy at that point. The G.E.C.K., otherwise known as the Garden of Eden Creation Kit, a.k.a. Fallout’s official mod suite, basically give tinkerers the same tools Bethesda used to actually create the game. This allows for a deeper level of scripting than is possible through the current hacked-in mods, and lets people get to work on those insane total-conversion mods that take years to finish. The one outstanding question in all of this: Does Bethesda bring back paid mods? April marks approximately one year since Bethesda and Valve tried (and failed) to foist paid mods on Fallout 4’s predecessor Skyrim. There’s still a half-decent chance we see the idea resurface alongside the G.E.C.K. If so, will the community react better to the idea when it doesn’t disrupt a years-old modding ecosystem? Possibly. Or we might find ourselves mired in a debate about “The Spirit of Modding” versus “People Getting Paid For Their Work.” It almost makes you wish for nuclear winter.